Kerbal Express Airlines is in need of updating its aging fleet of regional jets and turboprops. It's a big client, operating at hundreds of airports around Kerbin, and that means big fleet sales. Does your aircraft company offer the right kind of aircraft for the job? Kerbal Express wants profitable aircraft. They're looking for aircraft that meet or exceed their requirements for fuel efficiency, speed, range, passenger load, ease of training, and cost of maintenance, for the right price that gives them the best return on investment. They also want a design that's flexible, offering variations of the same design for a variety of different routes. TweakScale is allowed, just please don't ruin the spirit of the challenge with it. Small aircraft must have at least 1 pilot in a cockpit, and medium-large at least 2 pilots. Command seats can be used, but you must build a cabin around them. No rocket engines. Aircraft engines only. You don't have to use propeller engines in the Turboprop category, nor do you have to use jets for the Jet categories. Minor clipping is allowed, within reason. A rolling runway takeoff is required. Takeoff & Landing speed of no more than 80 m/s on land , or 120 m/s on water. Action Groups must be listed in the Ship Description. Model variants may only have minor differences between them to be considered. To improve your design's competitiveness, your company can submit a variant of the same design (See Wants section below). A variant is built on the same model platform with minor changes in design to give it, say, extra range, or extra passenger room. This is most commonly achieved by adding fuel tanks or lengthening the cabin, sometimes with minor changes to wing and emmpanage design. To qualify as a variant, it must generally have the same structural layout, meaning engines, gear, and lift surfaces must be in roughly the same location & design. Basically, if you make it too different, it will be considered a separate model/submission. For all categories, Range will be calculated by fuel capacity / burn rate * speed / 1000m at the recommended cruising speed & altitude. 32 Passengers, and optional 40 Passenger variant with an extended range of at least 1200km. 72 Passengers, and optional variant with extended range of at least 2000km. 40 Passengers, and optional variant with extended range of at least 2500km. The name of your aircraft company and model names for the designs you're submitting. Please clarify what category you're entering the plane in. 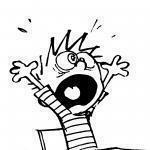 At least one screenshot of your designs. A link to your craft files in your submission post. 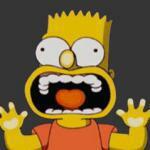 No PMing me. The recommended cruising speed and altitude for your aircraft. This is the speed and altitude you've fine-tuned your designs for, ensuring the best balance of speed, range, and fuel efficiency. It's also what the test pilots will be testing your aircraft at for judging. (Optional, but will help in review) Pitch your aircraft to the Kerbal Express Airlines executives, selling them on why it should be purchased for their fleet. Include any notable features (even if fictional). @ImmaStegosaurus! 's Ka-24 - A very high performing, albeit pricey, seaplane. @Samwise Potato's SF-A232 "Lupin" - Deceptively powerful and high-performing, and can take off and land from just about anywhere. The Lupin has all the qualities we're looking for in a seaplane. 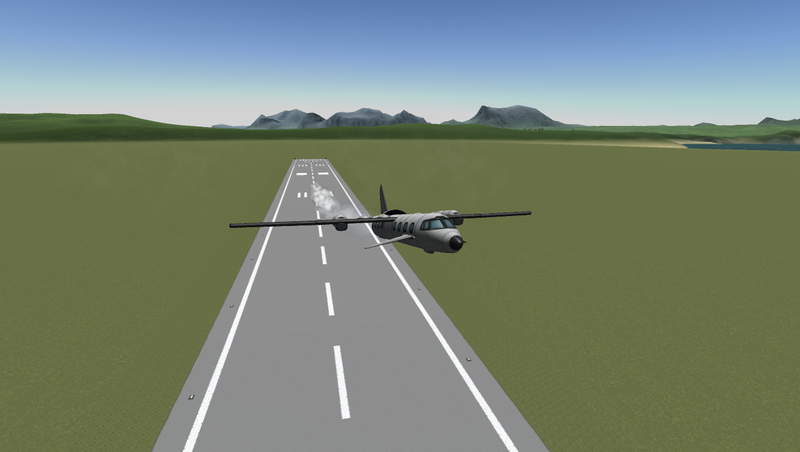 @Eidahlil's Dusty Turboprop - A dirt cheap but surprisingly fast design, and it gets the job done. @ImmaStegosaurus! 's Ka-12 series - Inefficient and insanely unreliable. Not recommended unless the engines are replaced. @no_intelligence's Kombarder 300 series - Very hardy, and can take off and land on just about any surface. @GDJ's AVRO Prop-Star - Very solidly built, comfortable, with a surprisingly long range. @AeroGav's "Fulmar" Turboprop - An aircraft with some puzzling design choices, but ultimately a wonderful turboprop with a long range and easy takeoffs and landings. @CrazyJebGuy's GAI Turbo-XL Classic - Offers good performance and a very appealing exterior. This plane is also quite large for a turboprop. @panzerknoef's Bx-1/2 "Shoebox" series - Very inexpensive and they do get the job done, but you'd better be a good pilot because the Shoebox lacks functional windows in the cockpit. @AeroGav's Screechcraft Starcraft - A very fast plane with exceptional range, but features sub-par maneuverability. Also pulls double duty as a supersonic jet. @tsgaerospace's SP-32-1 "Arrow" - An absolute delight to fly, and quite reasonably priced. The Arrow has all the qualities we're looking for in a small regional jet. @dundun92's URJ-101 - A well-priced, 4-dimensional aircraft that defies all known laws of physics. 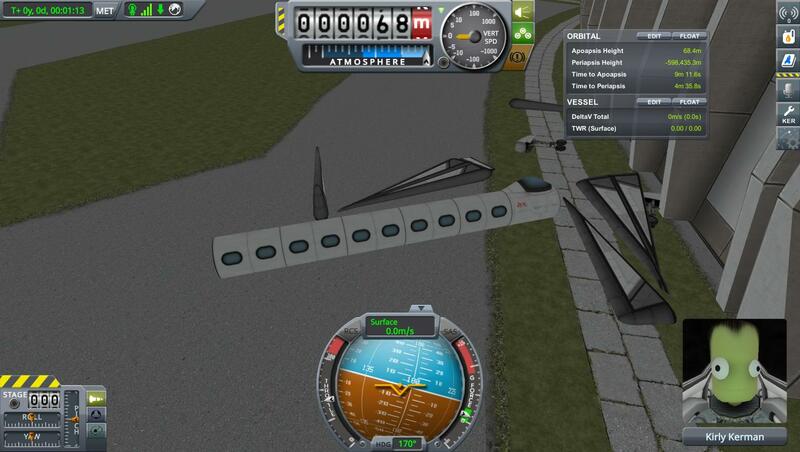 @TheEpicSquared's ISRJ-32 - Offers wonderful performance, but at the expense of Kerbal comfort. @aerodis's AerLeeker 3.6 - Offers a comfortable and smooth ride, but is quite expensive. @Cabbink's Alice - We're not entirely sure what this is supposed to be, but it does make for a very versatile, if expensive small regional jet. @AeroGav's Screechcraft Starcraft NEO - Unique in looks and above average in all other categories. The Starcraft NEO has all the qualities we're looking for in a small regional jet. @no_intelligence's Kombarder 400 series - Offers a neo-futuristic aesthetic and wonderful performance all around. Except on landings: it bounces. @SuicidalInsanity's IA-720 - Offers an innovative design at a reasonable price. The IA-720 has all the qualities that we're looking for in a medium regional jet. @logman's Kerman Dove - Unreliable and very unsafe: it's not uncommon for the rear cabins to be destroyed on landing. Avoid this plane. @logman's Kerman Stingray - Very solidly built, reliable, and handles wonderfully. Hampered only by its large price tag. @ImmaStegosaurus! 's Ka-62 - Sturdy and reliable, but suffers from a large price tag and low fuel efficiency. Its exterior is reminiscent of designs from 50 years ago, too. @AeroGav's Screechcraft Starcraft - A fast plane with exceptional range, but features sub-par maneuverability. Also pulls double duty as a small regional jet. @Bob_Saget54's SAI Concorde Mark II - Very fast with a long range, but suffers from an inferior airframe and high maintenance costs. 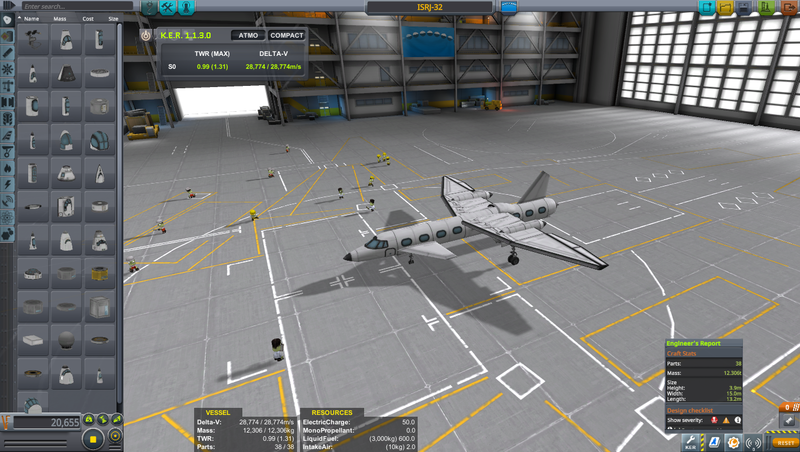 @TheEpicSquared's ISSJ-40 - Blindingly fast, inexpensive, and high-performing, but sacrifices some Kerbal comfort. @shdwlrd's Hope series - Very fun to fly, and is just plain cool to look at, but suffers from a high fuel consumption. @reachmac's Karvo 370 - Handles well, but requires a larger runway than most airports currently have. Not recommended unless the buyer is absolutely sure the airports can support it. @Laie's Sonic - This thing can basically fly itself, it's that stable in the air. Maintenance costs are high, though. @sevenperforce's Transcendent Spirit - Insanely difficult to control, and the landing gear is insufficient for such a large aircraft. Not recommended. @Eidahlil's Potato - Understandably difficult to fly, but offers good Kerbal comfort at a low price and enough range to circumnavigate the planet. Any and all suggestions to improve this challenge are welcome. I'm in. I missed the deadline by a day last time this challenge was open. Just one question, do regional jets have to use jets or are turboprops an option? You can use whatever engines you want for whatever category you want. The separate categories aren't meant to define what engines you can use. I'll update the OP. 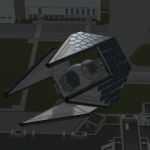 The Screechcraft Corporation would like to submit a design originally commissioned for Kerbin International Airways (K.I.A.) , the Screechcraft Starship. It has a seating capacity of 40 (5 mk1 cabins), costs 42,999 Funds and has a part count of 42. It is likely to have a higher cost and part count than some of the competition since the original customer wanted a craft that could supercruise without afterburners. I would like to point out that the Starship retains this ability for overwater flights, and is also able to cross the sound barrier without noisy, inefficient afterburning. 14km, 100% throttle (dry) 572 m/s cruise with 0.10404 Units total fuel consumption. 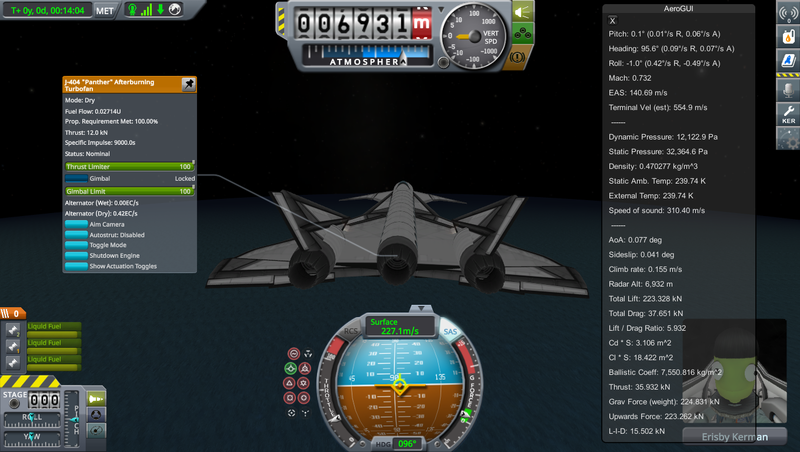 Subsonic cruise is with 32% throttle at 7km and 227 m/s. Fuel burn is 25% lower, but you can see that passenger miles per gallon is better operating at its design speed. Screechcraft's Spaceplane design experience has been leveraged to create an airframe that performs well in all low dynamic pressure regimes, namely fast and high as well as low and slow. The fighter style inline cockpit has allowed us to place a crumple zone to protect the flight crew in the event of frontal impact at typical landing speeds. Remember, crew learn from their mistakes, keep them alive and you'll soon have the best pilots in the industry ! I'm going to say no to FAR. I don't know how it'll affect the fuel consumption, and it would be in your best interest to optimize your planes for the stock atmosphere anyway, because that's what I'll be flying them in. Can we use the aerodynamics parts from the MK2 & MK3 expansions? 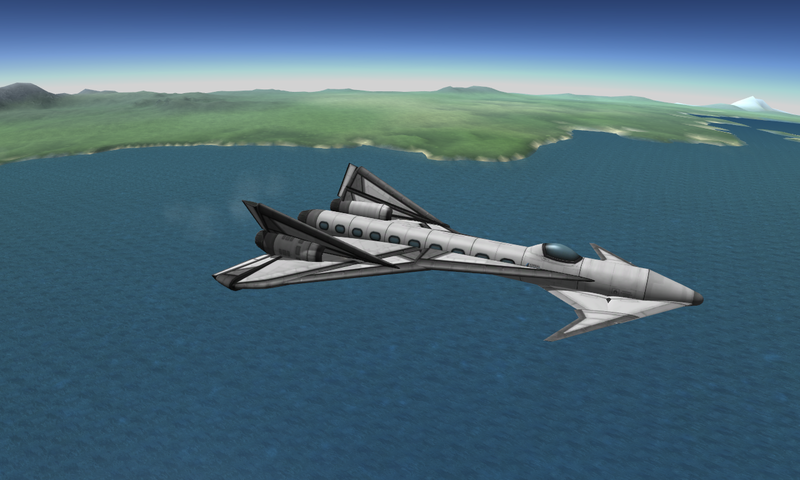 We at Kerbal Express Airlines are not entirely sure what to make of the Screechcraft Starship. On one hand, the Starship performs admirably at all speeds and all fuel distributions, so it can be used at a variety of airports. Notably, it can reach its takeoff speed in less than four seconds. Its simplistic design of 42 parts makes it easy to maintain, too. On the other hand, it weighs 24 tons and doesn't turn very well, so it requires a long, very careful approach for landings. The landing itself is very easy; the Starship's well-balanced wingspan makes flying at speeds as low as 40 m/s quite easy. The range is very high: 5000 km at optimal altitude and cruising speed. 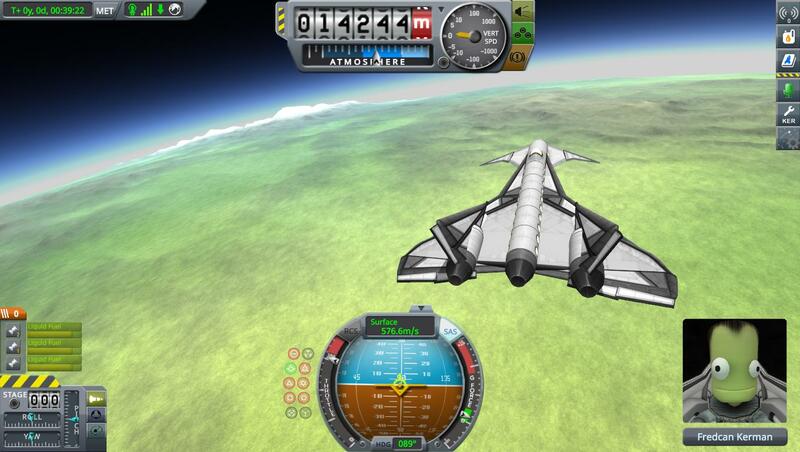 However, Jebadiah Kerman was unable to reach the advertised 14,000 m without the use of all three afterburners, and even then, the maximum speed reached was 350 m/s, not 500 m/s. We're not sure if Screechcraft used an autopilot or if Jebadiah was simply not up to the task, but we don't see 14,000 m as viable. The main criticism we had with the Starship was its price tag of 41,619,000. It's simply too expensive to put into widespread use. 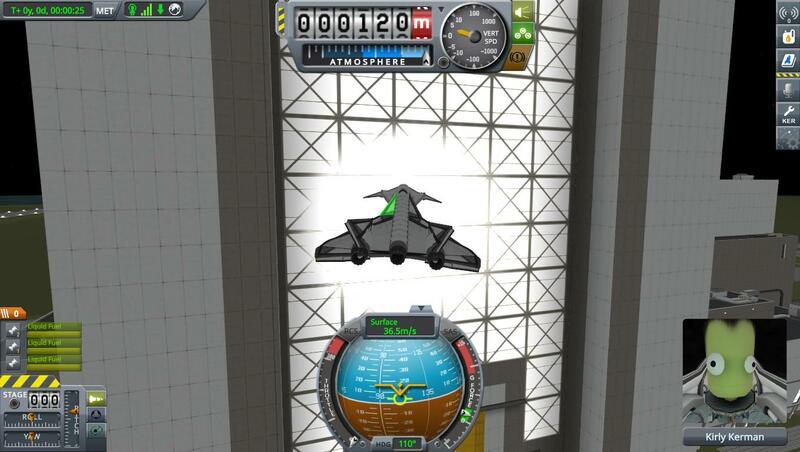 Update: Upon further testing, Intern Jorley Kerman managed to push the Starship into supersonic territory. It performs as advertised, with a range of 4,800 km, and a speed of 535 m/s at 13,000 m. We did note that it was difficult to slow the aircraft down; due to its lack of toggleable flaps, the landing was performed at 160 m/s. The Screechcraft Starship's winning feature is its range. It will fly you anywhere you want it to, and very quickly at that, but you will need to avoid mountains. Ordering 3 for use on trans-oceanic routes. Contrary to some reports, the Starship is in fact quite capable of achieving supersonic flight without illegal use of the afterburners and using the basic autopilot supplied with the aircraft. 2. Activate SAS and set mode to Prograde Hold. Leave throttles wide open at 100% but under no circumstances activate afterburner. Use of afterburner voids warranty and may trigger military action from the KDF IR monitoring network. 3. Aircraft will accelerate to mach 1.5-1.9 on its own and oscillate between 11-15km in a series of Phugoid oscillations. These may dampen out eventually but once properly supersonic and at altitude, I recommend deactivating SAS and manually adding pitch trim. 4. Use ALT S to add small amounts to nose up trim and limit the dive rate when it noses over at the top of a phugoid, use nose down trim if it starts climbing rapidly over 13km. 5. When the flight path is more or less level at 13km, use ALT X to remove all trim, and set SAS back to prograde hold again. The aircraft will remain level though may gradually drift up to 14km and stay there. The aircraft was flown with keyboard only. No pitch or rudder inputs were made , the vertical flight path was controlled only by turning SAS on or off, or changing mode from Attitude Hold to Prograde Hold. As you can see, during the initial climb , SAS was turned on Attitude Hold mode to stop the nose from rising too steep. A simple plane for transporting passengers or livestock to the next town over, the Dusty line by Abstract Aerodynamics is just perfect for the airline on a budget. With the base 24 passenger model available at the low low price of 8 121 000 and still boasting great features such as seats and interior lamps, you just know the offer cannot be beat. We also offer an elongated variant of the Dusty for those lucrative crowded routes, so you can use those same spare parts for all your planes. Recommended cruising parameters: 280 m/s cruising speed at an altitude of 11.2 km. Estimated range of 840 km with a typical fuel consumption rate at cruise of a bit less than 0.05 units/second. Recommended landing and takeoff speed is 50 m/s. The landing gear was, like all parts, made by the lowest bidder, and is rather flimsy. 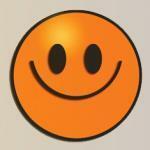 It will cheerfully break if a landing is attempted at a lower airspeed (higher vertical velocity). No airbrakes are included, however we believe the reverse thrust function (action group 1) will cover all your airspeed reduction needs. We are just as surprised as you are with the high cruising speed, the original design was planned for only 160 m/s. However, as mandated by all applicable laws and regulations, we thoroughly tested at speeds up to 320 m/s and detected no structural weaknesses. So go ahead, throttle up all the way. The Dusty XL variant features an elongated hull with an increased passenger capacity. To accommodate the higher mass, the wings were slightly extended. Obviously the higher mass also reduced the range, which fell below the requirements for this category. This can be remedied with a bolt-on fuel tank capable of storing an additional 50 units of fuel, however this tank is entirely optional, and can be rotated in and out by two engineers using typical service equipment in under 15 minutes. The effects of the bolt-on tank are included with a plus sign where relevant. Recommended cruising parameters: 245 m/s cruising speed at an altitude of 11.0 km. Estimated range of 720+230 km with a typical fuel consumption rate at cruise of about 0.05 units/second. Note: If a capability to land on grass fields and poorly maintained airports is required, sturdier landing gear can be fitted for an estimated additional cost of 1 450 000 for both variants. name of the plane: SP-32-1 "Arrow"
the TSG SP-32-1 "Arrow" is a relatively cheap and low maintanence turbofan airplane capable of transporting 32 kerbals over 1500 km, it uses 0.11 units of fuel on the high end and 0.08 units on the low end, it´s easy to fly, highly maneuverable and includes flaps and an engine capable of retroburning to help with landing. the TSG SP-32-1 "Arrow" is a smart choice for anyone who needs to take up to 32 kerbals to the other side of the world ! Ah, I didn't do this. Thanks. I'll update your review when I'm back at my computer. DCS World F-15C Eagle driver. Airborne Technologies presents the URJ-101 Small Regional Jet. Sounds like something to do. 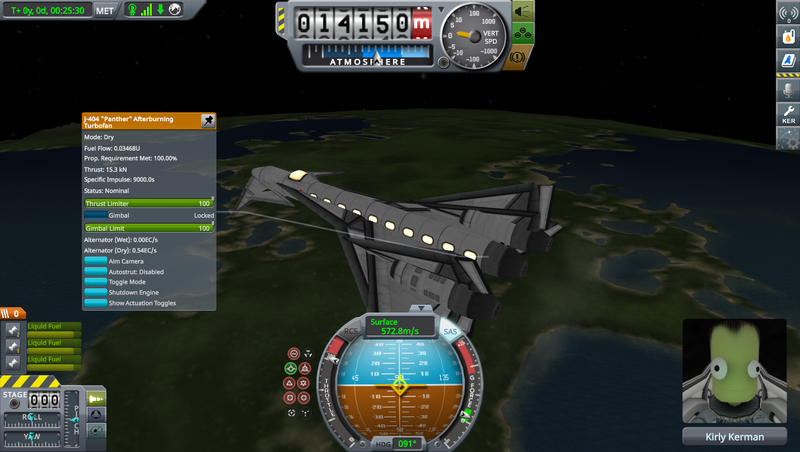 However, any shots you see of my craft may look odd as i have AfterKerbin(planet pack beta) on my saves. No difference on solitude (kerbin) as all physical characteristics are the same. Also, how about adding a mega plane category, with a capacity of 120+ passengers? Thanks! Edit: how about long flyers? Maybe a plane with at least 10 passengers, and able to go around Kerbin 4-5 times? Agreed. I was also thinking about something like this, for high-demand medium-to-long haul routes maybe? @Mjp1050 What do you think? Presenting the Iridium Small Regional Jet 32 - the ISRJ-32! The ISRJ-32 features the latest in passenger comfort and simple maintenance, while being relatively inexpensive to boot. For the nominal price of 20,655,000 kerbucks (price reductions are expected in the near future), the ISRJ-32 offers comfortable seating for a maximum of 32 passengers, an extremely stable plane (thanks to the precise positioning of the wings), and flexibility at airports thanks to its short takeoff and landing capabilities. Maintenance is extremely simple thanks to the presence of only a single Wheesley engine. The thrust reverser, as well as the four airbrakes, ensures that speed can be increased and decreased easily in midair. The large wings present means that the plane can reliably glide, and means that flaps are not necessary. This simplifies maintenance even further, as does the low part count of 38 parts. Despite the plane seeming like it would be damaged by a tail strike on every takeoff, this is impossible, as a protective I-beam has been installed as a protection during tailstrikes on takeoffs up to 80m/s. Although this shouldn't be necessary, as the plane can take off easily without a tailstrike with proper piloting. Recommended cruising altitude: The ISRJ-32 performs best when cruising at an altitude of roughly 8.5 to 9 kilometers above sea level. Recommended cruising speed: The ISRJ-32 doesn't have a particular speed to maintain. Just get her up to the cruising altitude and open up the taps. Top speed should be around 245-260m/s, depending on what altitude the plane is being flown at. EDIT: Tip - you might want to decrease the control authority of the ailerons, or the craft might be a bit sensitive to roll input. Thinking back to the last challenge, I'd also suggest rebalancing the passenger capacity of the cabins. With the current numbers there is absolutely no reason to use the Mk2 cabin (same capacity as Mk1, but heavier and more expensive), and the 2.5m cabin is also lighter and cheaper than the Mk3, while seating the same number (the only reason to use it is if you don't want to install mods). Further evidenced by the number of entries resorting to (what I'd call) wacky designs to use the cheaper Mk1 cabins. A kerbal is 1m tall, so for comparison we'll multiply all dimensions by 2. I'll compare this one with the Bombardier CRJ200, which has a hull diameter of 2.69m, which is close enough to 1.25m * 2. The total cabin length including cargo (which we're not including separately) is about 16m, so it seats about 3.2 people per metre, so about 12 passengers per cabin. To maintain consistency, let's divide that by 1.5 to get back to 8. Taking, for example, the Boeing 747, it seats 16 people instead of 4 for the same length, and the A380 seats 18. It has a lot more space for baggage underneath too. The Mk3 is twice as long as the Mk1, so it would be reasonable for it to seat at least 8 times more people. Looking at the A380 (only part of 747 is double-decker), it also has some unoccupied spaces for storage, but it also has quite a few non-economy seats with extra space. With a cabin length of about 47m seating 544, it seats 11.5 people per metre, which is in line with our estimate, after accounting for first-class seats. So the Mk3 should seat at least 64 passengers. I'd suggest 72 to make it easier to balance with the 2.5 cabin. I couldn't find any passenger equivalent of the Mk2 cabin, but at twice the width, twice the mass and 8 times the price, having it seat double the Mk1 capacity seems somewhat reasonable (assume a two-aisle arrangement). So 16 passengers. At 5m it's bigger than the typical Boeing 737, but not quite big enough to be a true double-decker. It's also oddly light for it's size, even the hitchhiker with it's 6m/s crash tolerance (no reinforcement) is heavier, and it's half the length. So for this one I'd depart from measuring by part size, and suggest 24 passengers for balance reasons. And before anyone starts shouting that 80kg per passenger is unreasonable, don't forget if we rescaled all dimensions by 2, mass increases by 8, so that's still 640kg/human. The Mk1 is still overwhelmingly cheaper, but the Mk3 and 2.5m cabin might become somewhat competitive with a lower mass/passenger. The Mk3 is heavier per passenger, but seats more for the same length, and the 2.5m parts have better drag characteristics. And sometimes a plane is just too long, so using the Mk2 might still make sense to get a higher crew capacity without resorting to twin-fuselage aircraft, which, let's be honest, are all wacky and thus are disallowed by the rules. Though having the 2.5m and Mk3 seat even more passengers would probably still be balanced. Additionally, since the capacity of the Mk1 is unchanged, the change would not affect any of the entries up until this post. No, sorry. Airplane Plus is the only parts mod allowed. Are you two thinking of something along these lines? I approve! What were your thoughts on this? I'm thinking a minimum speed of 270 m/s, passenger capacity of 120, minimum range of 3000 km. That reminds me, I should make a Supersonic category. I'm going to say no to this, because this challenge is about creating airliners, not necessarily endurance aircraft. That's an absurdly long range! @Mjp1050 did I miss something? Oops, my bad. I gave the wrong formula. The one I'm using is fuel capacity / burn rate * speed / 1000m. to get the theoretical range. I'll update the OP. So your range would be: 600 kal ÷ 0.08 kal/s * 245 m/s ÷ 1000m/km = 1837.5 km. Not bad. IA-E720 Variant on the left, standard IA-720 on the right. The IA-720 is an economical, high capacity long range commercial airliner. At a mere 32,739,000 funds and 48 parts, it is capable of carrying 72 kerbals in relative comfort thanks to its wide body design. Powered by a pair of fuel efficient Wheesley Turbofans, its capable of cruising up to at least 1600km without refueling, reaching a top speed of 285m/s at an optimum cruising altitude of 5500m with a fuel consumption of around 0.22 units of LF per second. If fuel economy is preferred over speed, climbing to 7500m will extend range by several hundred km, but cruising speed will drop to 240m/s. - Aerodynamic, wide body design contributing body lift to the craft, reducing wing span( and drag) needed for a craft of its size, improving fuel efficiency and permits access to smaller airports. - By increasing the number of seats threefold while keeping the number of windows the same, purchasing Airlines can charge more for window seats. - Widebody fuselage is buoyant; the IA-720 is a capable seaplane allowing multi-role usage and servicing of seaside locations. 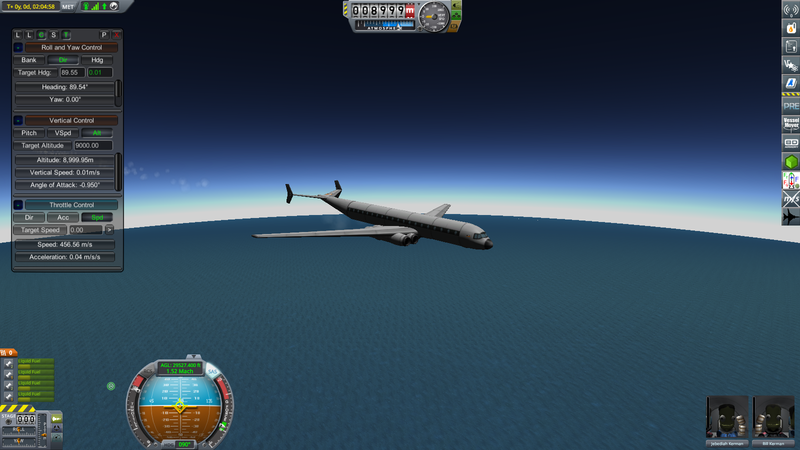 - 50m/s takeoff speed, and 40m/s landing speed on both land and sea. In case the IA-720 is insufficient for today's Airline, Insanity Aerospace also offers the longer range IA-E720 variant. At 34,839,000 funds and 58 parts, the E720 is capable of carrying up to 80 kerbals, while extended fuel tanks permit a range of at least 2100km. Fuel consumption remains the same, but increased mass of extra fuel does impact speed, with a max cruising speed of 260m/s at 5500m/s. - Same overall airframe as the IA-720. Wherever the IA-720 can go, so can the E variant. re afterburners allowed? Since afterburners are only allowed on military craft IRL, i think the panther should be limited. 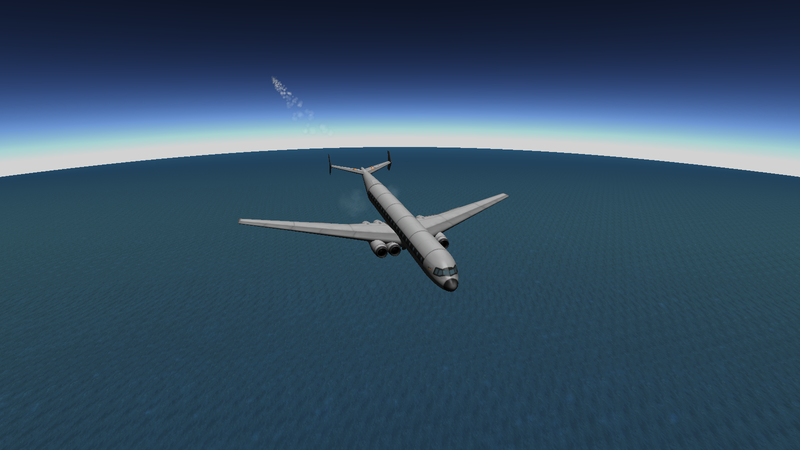 So I built my beauty of a plane, just cruising. Everything looks good, right? Well, after about 2 hours and 3500 km of flying later.....look at the speed. Just 4 Weasley engines, no tinkering on the engines.